Don't play it don't play it don't play it. "ALL BY MYYYSEEEELF, DONT WANNA BE..."
Kevin couldn't understand it, he'd put four duplicate sets of his 2cv car keys in the basket, and not one had been picked up. "Roger, roger take the shot now, that'll teach the scumbag to take my missus"
"Are you sure this will turn me into a vampire?" Bob was beginning to regret swopping his wife for an invisible phone. He was going to try and have a conversation with the woman in the burka, but when he got closer he realised it was a shadow. When you'd rather be anywhere else but ear. "All that fuss just because his cat died. I mean, people just shrugged when I told them I had cancer." "Charlie , Delta , Tango , in position ,red laser gun aimed at arch rival, I repeat , shoot NOW!" A quick tweak of the wig before he caught his best pal Dave with his Mrs.
"My patent behind-the-ear-laser device should get that b*st*rd right through the heart." To ease his disgust that young Boris Johnson stole his date, young David Cameron looks for a pig's head to f#ck. 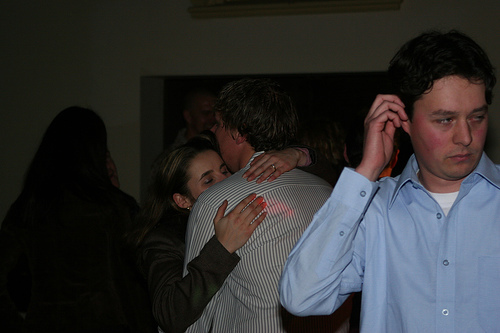 "IT'S GREAT TO BE AT A CAPTION.ME PARTY...EVEN IF YOU ARE TERRIBLE DANCERS," chimed anonymous. These days working security at college parties is the best job Mike Tyson can get. Elves are among us, but they cleverly hide their identity. Using his telepathic powers, Charles Xavier instructs his friend Cyclops to take out his love rival. Captioneers will go to all lengths to hide their identities but Colin had just spotted somebody nodding profusely in the corner.